Shekhar Iyer, senior associate editor of the Hindustan Times, was present at Patna’s Gandhi Maidan where a series of bomb blasts rocked Bharatiya Janata Party’s Hunkar rally, and soon after Narendra Modi, the party’s PM candidate, delivered a political speech. 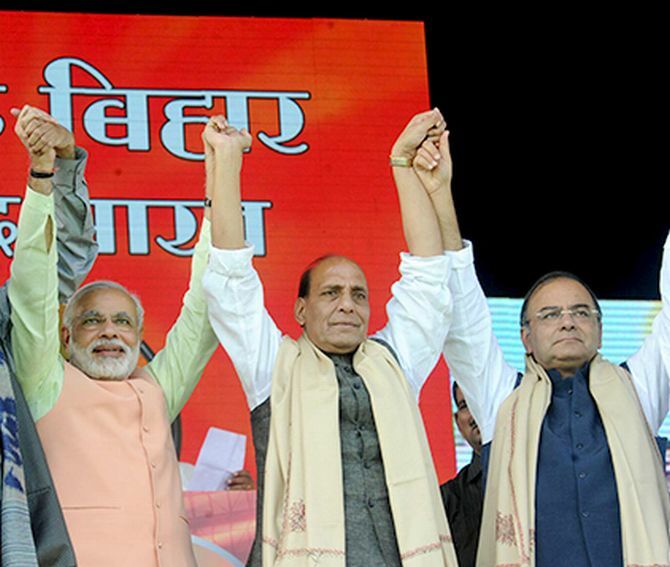 It was one of the most unforgettable days in the history of public rallies in India. If something had gone further wrong, hundreds of people could have died in a stampede after the series of six blasts that killed six people and injured 82 others. In a brief chat with Rediff.com, Iyer, a distinguished journalist, took us through the eventful day that took his breath away. “When we reached Patna on Sunday morning at around 8 am, we saw lot of people on the roads. We didn’t see much of security arrangements. We went straight into the city from the airport. I got the first SMS about a blast near the Patna railway station on my way to the hotel. By the time we reached Hotel Maurya, which overlooks the Gandhi Maidan, we were talking about the blast. When we were having our tea, we heard a boom!! The deep loud sound of the bomb blast echoed in our ears. Local people said the sound was not of crackers. Then, we went to the ground. There was no policing whatsoever. Security forces were spread thinly. We reached at the media section at around 11.30 am. More than half of the area in the vast ground was full of people. We were told that people who had come into the venue in a dozen trains, and most of them had arrived at 7 am. Some were coming through ferry boats from across the Ganga. Some came on special buses. The political speeches started at around 10 am. The ground is so vast that people at one end did not know what was happening at the other end. When the first blast happened at the venue, few people started running amok. They even left the ground. Between 12 and 1.15 pm a lot of tension was visible. On stage, BJP leaders Shahnawaz Hussain and Rajiv Pratap Rudy were holding the show. They were communicating to the crowd and shouting out “patakhe mat chhodiye (don’t burst firecrackers)”. They were trying to give the impression that these were only crackers to prevent panic, but soon after 12.15 pm another blast took place. Then they said that some tyre had bursted. Biharis are known for their taste for politics. May be that kept them there. They simply didn’t escape the ground zero. In spite of blasts they stood. Funnily, later, I saw that as we hoot street dogs, some of them were throwing stones at the suspected time-bombs to nullify the clock inside it. This can happen only in Bihar! There was no frisking. Police didn’t care if journalists were not having ID cards. May be the crowd did what they did because they came to know about the deaths only later. A lot of drama happened at the Patna airport, too. The Gujarat police advised Modi not to go to the Gandhi Maidan. His officers told him that it’s risky to venture out of the airport. 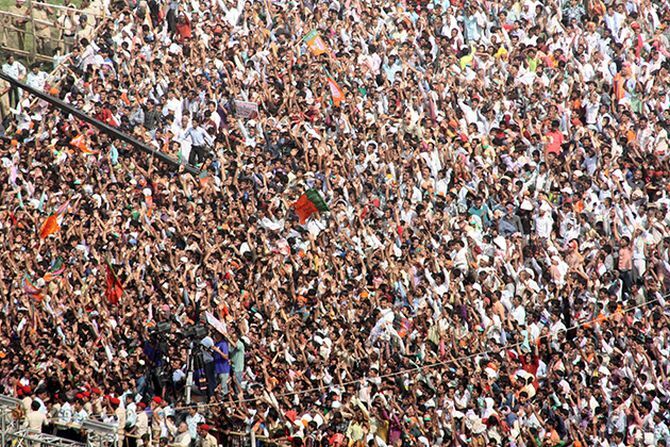 Modi asked, “How many people are on the ground?” He was informed that a huge crowd was waiting. He decided to go. BJP president Rajnath Singh was with us in the hotel. Already some bomb blasts had happened. Still Rajnath said he will go to the venue. When he reached there he met senior leader Arun Jaitley too. Both discussed the situation. Two senior Gujarat police officers told them that six bombs had exploded. The area was insecure. Many bombs must have been smuggled in and it must be hidden in the crowd of lakhs of people. No sanitisation has been done, no checking has been done and they claimed that the place was unsafe for Modi. Rajnath and Arun had to take the call. They thought even if they leave the place people were at risk. Even if the meeting got cancelled, a stampede was most likely to happen. Jaitley tried to talk to the police officer but there were no senior officers at the venue. Only one newly recruited additional superintendent of police was there. Jaitley asked the lady officer what was the evacuation plan for the leaders and people, but she had no clue. She said she will revert after talking to her senior officers. 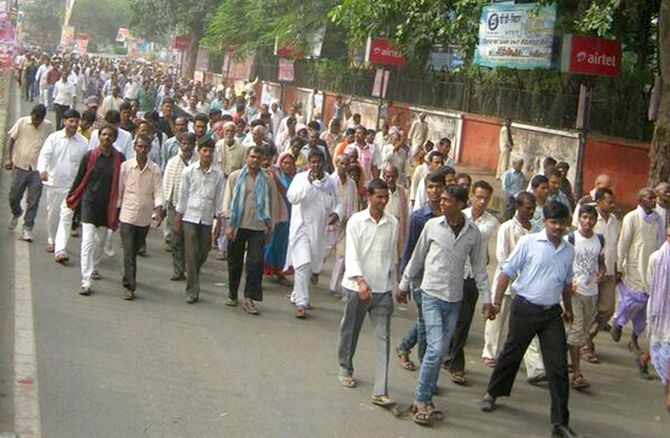 The Bihar police had not conducted any drill. Before Modi’s arrival it was decided that if something happens on the stage they would evacuate the leaders and cut short the event. Once Modi started speaking I think he forgot the risk on himself. Every one of us started reporting. We were lucky that during his speech nothing happened. As Jaitley said that in the first 15 minutes nothing happened and then the fear lessened. Modi spoke for 65 minutes. Even Rajnath spoke for 20 minutes and didn’t show any sign of fear or worries. Modi’s last lines portrayed how much tension they had gone through. But they successfully hid it from crowd. They knew that during the speech if the blast had happened, a huge stampede would have killed many people. Modi said while winding up the speech that “please go home carefully. Drive carefully. Don’t have accidents. Don’t rush. See that everything remains peaceful because Bihar should always remain peaceful”. It was a lesson in crowd management. The political leaders from the BJP and the Congress and regional leaders will have to understand it in future too. It was the decision that could have cost them heavily if something had gone wrong. The BJP leaders realised that there was no way to disperse the crowd peacefully. It’s one thing to gather the crowd, but another thing to disperse it. The special trains were there to leave in the evening only. What will the crowd do inside Patna? How will the local police handle them if the meeting was cancelled and some people got upset? In fact after Modi left the venue they kept playing cultural songs. We journalists were looking down at the table. We did not know what will happen next. We were cracking jokes too. We said if something happens to us hope our offices would hold a condolence meeting! We delightfully discussed who will write our obits! 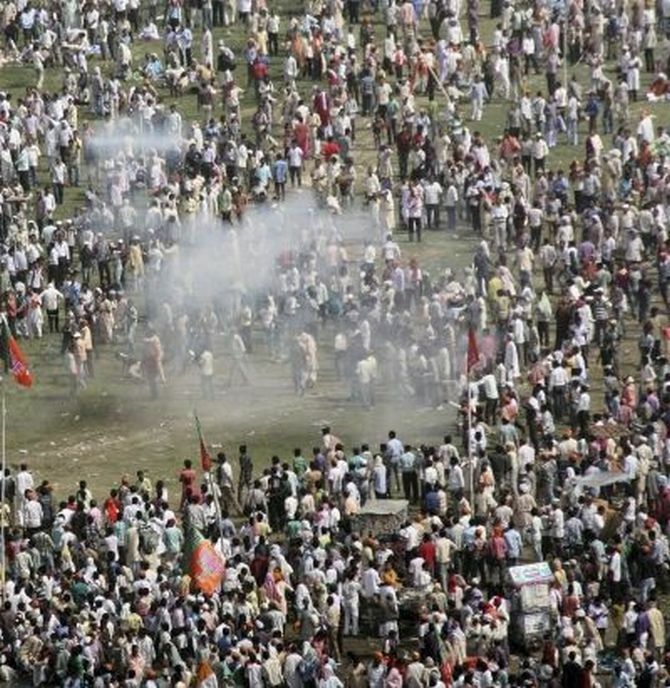 Even at the risk of their lives, politicians, people and media didn’t run away from Gandhi Maidan. Somehow none of us wanted to leave the place. We thought we are part of the historical moment. We wanted to capture it. That was the memorable thing about October 27. In the evening, we reached the airport. We boarded the plane. What did we see? Rajiv Pratap Rudy was in his pilot suit and greeted us. 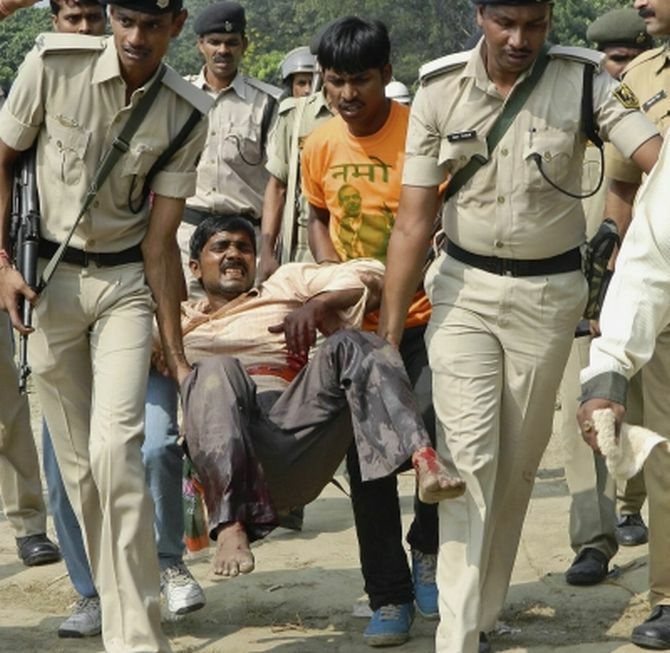 Was a human bomb used in Patna blasts?